Produced, directed, choreographed, lighting and music designed, and promoted a compilation of the last 15 years of our aerial dance repertoir. An exploration of modern dance, aerial technique, various apparatus, and character-driven/plot advancing movement. Insectinside has been performed in San Francisco, D.U.M.B.O. Brooklyn, NYC at the Philly Fringe Festival, and recently at the Brooklyn Lyceum in Park Slope. Exploring concepts of social unity, love, and madness, the story revolves around the mind of a homeless schizophrenic, Sid, who’s hallucinations transform ordinary (seeming) audience members and theatre staff into a collection of ants, crickets, fireflies, and other insects. 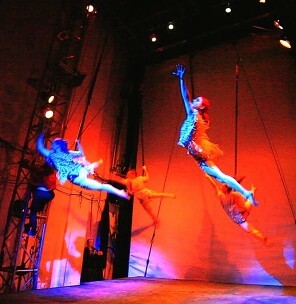 Aerial spectacle is an intrinsic part of the production, utilizing bungee cords, zip lines, silks, and other unique aerial rigging to immerse the audience inside of the insect realm created by Sid’s mind. 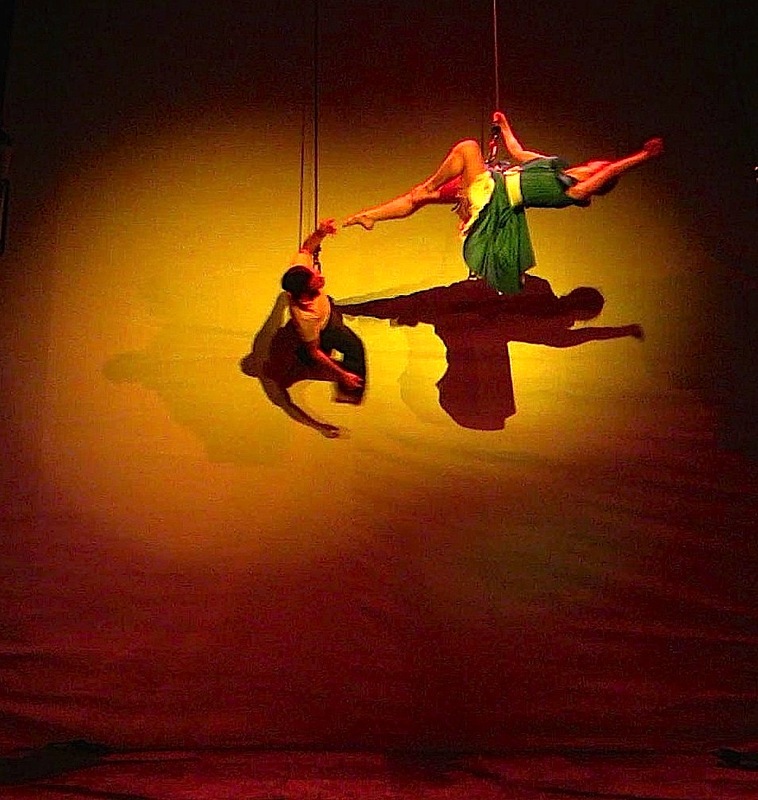 The climactic moment of the piece is the character Luna, dropping from a suspended ‘cocoon’ as she transforms into a Luna Moth with a 30 foot wingspan. Cast of 14 actors/dancers/aerialists. While our company is a core of 6 aerial dancers, we have a vast pool of talent at our fingertips. Our performances’ come from shows such as: Tarzan, Met Opera, Cirque Du Soliel, Stomp, Momix, Pilobolus, Cavalia, and De La Guarda. John Medeski- commissioned piece by jazz-fusion band Medeski, Martin, and Wood – John E. Oyzon- soundtrack. 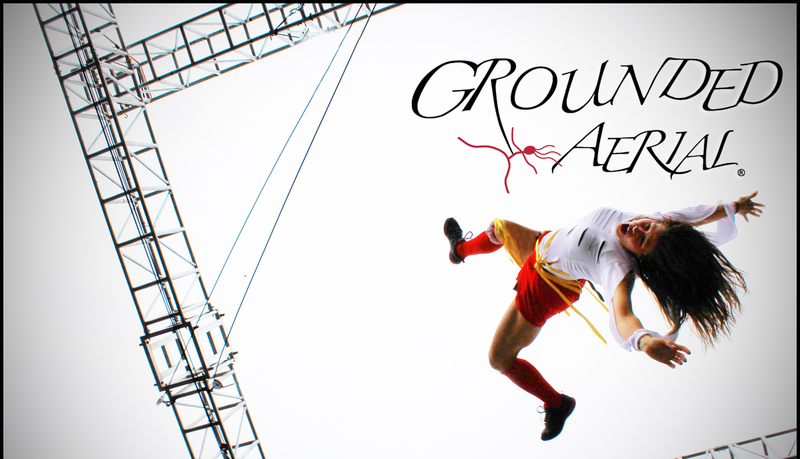 Grounded Aerial enchanted audiences at the Festival of the Fools in Burlington, Vermont, flitting through the trees on a whimsical quest for dreams…Afterwards, aerialists offered children the chance to fly. This inspiring story is perfect for both children and adults. Come fly with us!